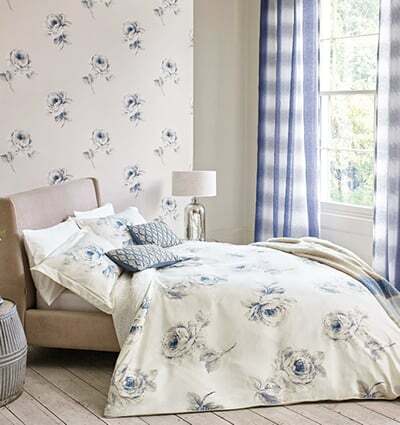 Explore my favourite top picks from the current Sanderson bedding collections, with designs including Waterperry, Delphiniums and Magnolia & Blossom. Being one of the oldest surviving English interiors brands, Sanderson have a rich heritage of soft furnishing designs to take inspiration from when creating their latest offerings. This cool, crisp design features a beautifully striking, hand-painted, watercolour floral pattern. Refreshing shades of mint green and aqua blue have been used for the flowers, against a crisp, white background. Plain white is also used for the reverse of this abstract design. However, detailed embroidered leaf pattern accessories are available to perfectly complement the range. Rosa is ‘classically Sanderson’ in its style of design, with its large and incredibly detailed pencil etched rose pattern. Inky blue painted highlights help bring the design to life, while also adding a subtle splash of colour. Oxford pillowcases complement the design perfectly, each one featuring a single, centred rose on the front and a plain, soft ivory colour on the reverse. 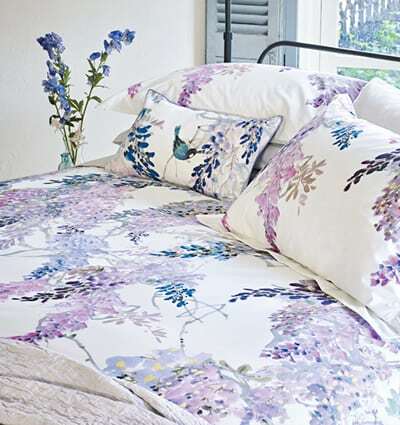 A super summery, bold, floral design featuring oversized Wisteria blossoms in various shades of lilac and purple. 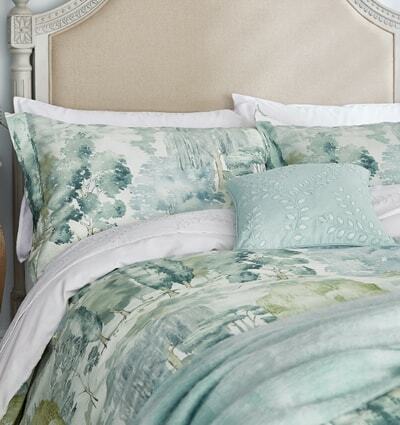 This Sanderson bedding design also boasts an array of playful butterflies and birds flitting between the petals. A plain parchment colour makes up contrasting reverse of the duvet cover and matching Oxford pillowcases. Celebrating the great British countryside in all her glory, Waterperry is decorated with a detailed selection of hand-painted native trees in various watercolour shades of green and aqua. 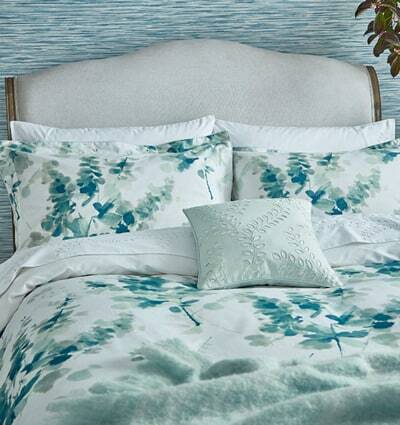 Landscape and nature lovers are sure to have a restful night’s sleep with this gorgeous design to snuggle in to. The range also includes colour coordinated throws and cushions to complement the design, with the cushion featuring an intricate cut-out, embroidered leaf pattern across the front. The striking Magnolia & Blossom design provides a more contemporary floral pattern without straying too far from a classic Sanderson bedding range. 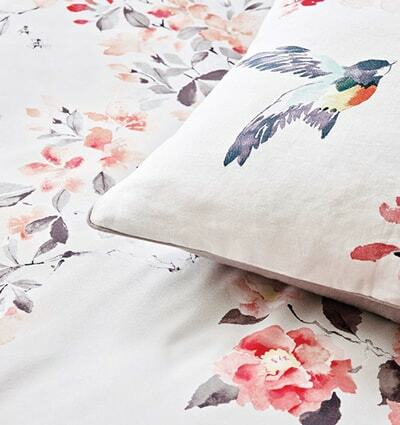 A mixture of pinky-red Magnolia and Cherry Blossom flowers trail across the centre of the duvet. These are offset by delicate grey leaves, colourful birds and buzzing bees. Large parts of the design have been left completely plain, helping to beautifully highlight the flowers and make the pattern a perfect focal point for a bright and airy bedroom, without it being too overpowering. Paper Doves is a fun bedding design from the Sanderson Home collection. 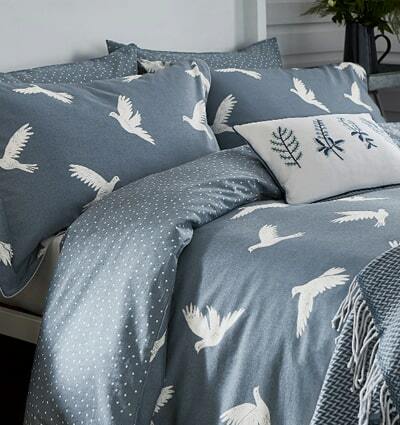 Available in both a ‘Denim’ (shown) and a lighter ‘Mineral’ colour version, the duvet cover and matching Oxford pillowcases are emblazoned with cute hand-drawn white doves in various stages of flight. The reverse of the design features a simple spotty pattern, which is also available as contrasting pillowcases. If you like these, you can find even more fabulous designer bedding collections in our Duvet Days story! Disclosure: Although no form of direct payment has been received for the writing of this feature (unless otherwise stated by the presence of "[Sponsored]" in the title), we may potentially earn commission from any purchases you make after following some of the links to retailers included within the content. However, your personal details can NOT be accessed by us at any time, or linked to the products purchased within your transactions. Full details. Join free for exclusive content, offers and competitions from WONS, delivered straight to your inbox!